The two anticipated Leonid meteor storms occurred much as predicted. European observers saw the peak at 04:09 UT (ZHR = 2,300/hr), while observers in the America's witnessed a storm peaking at 10:50 UT (ZHR = 2,600/hr). Both peaks were narrow, with a full-width-at-half-maximum of only 0.52 and 0.50 hours, respectively. Both peaks were also rich in faint meteors. As a result, the near-full Moon and bad weather at prime observing sites made visual observations from the ground difficult. Nonetheless, viewing from the airborne platforms was spectacular. 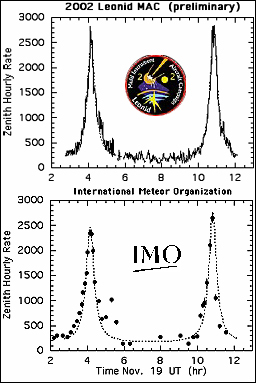 The graphs above show the preliminary results from 1-minute counts gathered by Morris Jones and seven other members of the flux measurement team on board NASA's DC-8 Airborne Laboratory during the 2002 Leonid MAC mission, as compared to visual observations gathered by the International Meteor Organization. The new observations provide important new data for dust trail models. The dynamic models by Lyytinen et al. and Vaubaillon were only minutes off from the observed peak time. The narrow flux profiles demonstrate that the dust trail does not widen over time, as in the models by Lyytinen et al., Asher and McNaught, and Vaubaillon. The measured width is only slightly narrower than predicted by Jenniskens (0.64 and 0.60 hr, respectively). In addition, the strong showing in Europe confirms the small trail shifts noticed earlier. The most important result may have been the abundance of faint meteors. While predicted in some models, such as that of Jenniskens, the distribution of meteoroid sizes in dust trails is not yet understood. A high background of activity persisted between the two storm peaks. That background may reflect the 1833 dust trail encounter (Lyytinen's prediction put the encounter time at 06:36 UT), or it could be a manifestation of the Leonid Filament.